Mokulito (“wood lithography” in Japanese) is a technique developed in Japan in the 1970s by Ozaku Schisi, and more recently by Polish printmaker Ewa Budka and her father Josef. Caroline attended Ewa’s workshop at ELP some years ago and ever since has been experimenting with mokulito printmaking and other alternative lithography techniques. Like traditional lithography, mokulito relies on the fact that water and oil do not mix and the image is drawn using greasy inks and crayons onto the printing matrix or plate. 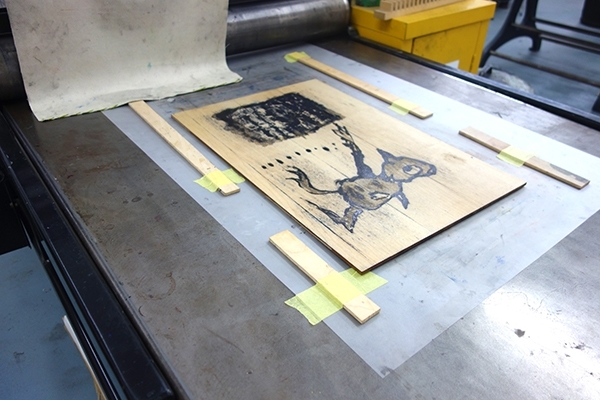 For mokulito, the image is drawn on a plywood plate, offering the opportunity to make large prints relatively economically. Because wood is an organic substance, the image changes slightly each time the plate is printed, meaning that editions are small and variable, with results depending on factors such as the species and age of the particular piece of wood and the weather. 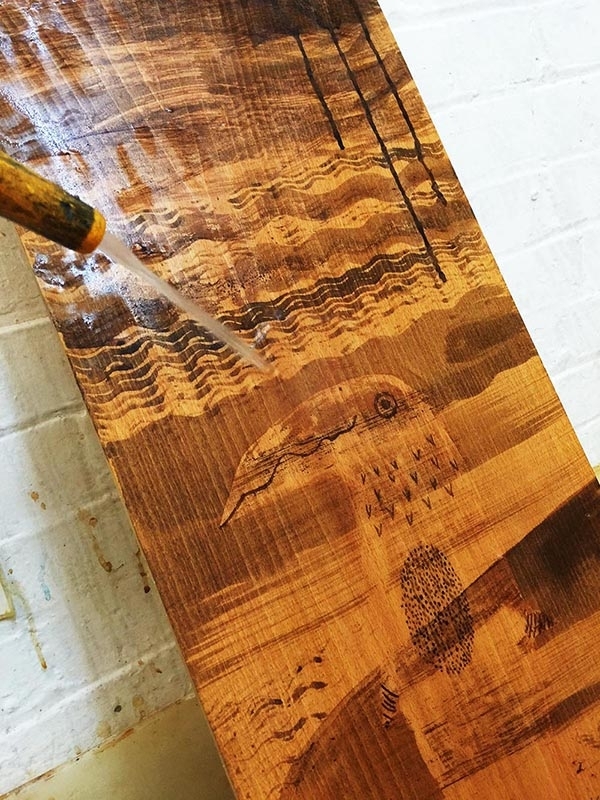 As the printing session progresses, the grain of the wood gradually becomes more dominant, often producing the evocative veils of colour that are so characteristic of this technique. A particular advantage of using wood as the printing matrix is the possibility of combining mokulito with woodcut, which can be used to produce contrasting sharp lines and textures that would otherwise be impossible to achieve. 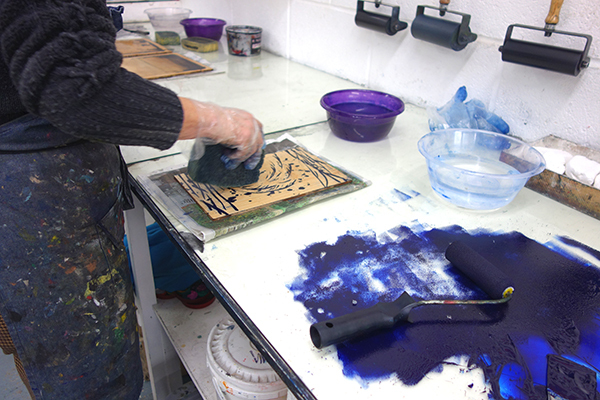 During this course you will learn to prepare and print a mokulito plate. We will use a very diverse range of traditional and non-traditional drawing materials and students will be encouraged to bring their own to experiment with. Day one: After an introduction to the technique and a printing demo, students will print pre-prepared test plates in order to gain an understanding of the process. Students will then prepare one or two plate for printing the following week (the plates work best if they are left to rest overnight or longer before printing). Day two: Students print plates made on day one, then continue to prepare new plates for printing on day 3. Printing experiments with resists and stencils. Day three: Students continue printing, including multiplate printing and will experiment with masks and chine collé. 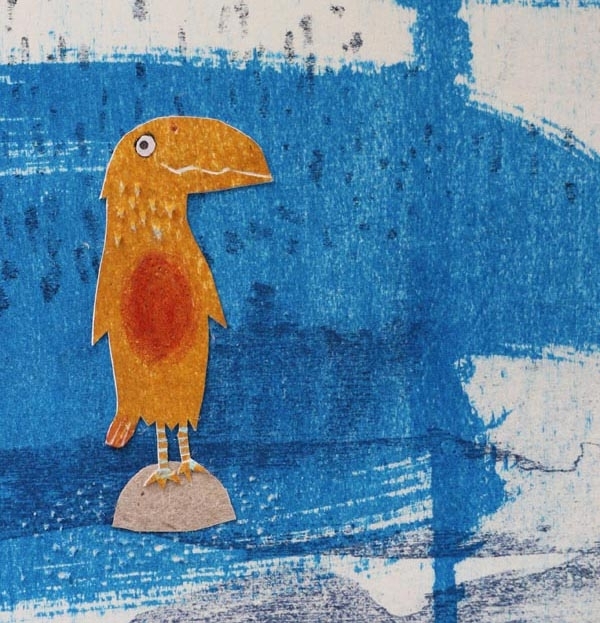 This course is suitable both for beginners and experienced printmakers – mokulito is a great technique for anyone who enjoys drawing and an experimental approach to mark-making. All drawing and printing materials will be provided, along with three plywood plates per student and cartridge paper for printing. Additional plates and other papers will be available for purchase at cost price. Caroline Whitehead has been a keyholder at East London Printmakers since 2011. Many of Caroline’s recent prints have been made using various forms of alternative lithography, such as mokulito), “kitchen litho” (using aluminium foil and Coca-Cola) and waterless lithography. She exhibits widely and her prints and artists books are in collections including the V&A Museum; Royal Free Hospital; Winchester School of Art; and Manchester Metropolitan University. Caroline graduated with a distinction from the Ruskin School of Art, University of Oxford. She also has an MA in Sequential Design and Narrative Illustration from Brighton University.